Samsung recently gifted 4,000 special edition Galaxy Note8 devices to all PyeongChang 2018 Olympians. During the Opening Ceremony, we saw athletes capturing and sharing all of these moments. And they weren’t just sharing images with their families and friends, they were sharing them with the entire world via social media channels. 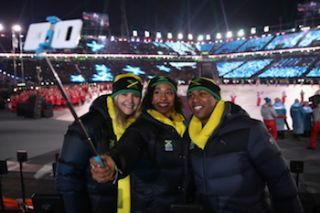 Viewers were watching the ceremonies from the comfort of their own homes, but also were able to feel like they were right on the field with these world-class athletes because of all of the behind-the-scenes content they could access. One of the amazing things the technology has created is something intangible—the ability to share experiences. Instead of a single camera tracking a downhill skier, there are multiple drone cameras showcasing multiple angles. It makes you feel like you’re flying down the slopes right alongside an Olympian. Besides feeling like you’re in on the action, you also feel like you’re a part of the team. With their new Samsung devices, athletes were able to share their point of view. You actually felt like you were walking alongside Team Great Britain as they marched into the ceremonies. I’m personally excited to keep watching the games and using technology to feel like I’m a part of Team USA. It’s fun. It’s authentic. And it’s creating a whole new Olympics viewing experience.